If you’re considering a kitchen or bath remodel in the Tempe, Arizona area, you know that the biggest challenge is finding a high quality contractor. Everyone has heard the horror stories from friends and family about contractors who did a shoddy job, cheated them out of money . . . or didn’t even finish the job, leaving homeowners with a half finished mess. If you don’t do your homework, these horror stories can become a reality. The good news? By following a few simple steps, you can greatly increase your chances of having a successful, solid and great looking remodel. Do you have family and friends in the Tempe, Arizona area? Then you’re in luck! Word of mouth is easily the best and most popular way to find really great kitchen and bath remodeling contractors. Friends and family who have gone through the process of kitchen and bath remodeling from start to finish with a contractor have real world experience with a contractor and are a trusted source for you. That’s an unbeatable combination! 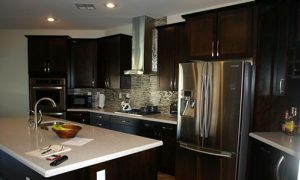 Ask them everything about their Tempe Arizona kitchen and bath remodel. Who did they use? What did they charge (if they’re willing to tell you)? Were they professional? Were they fast? Were they fair? Did they explain everything they were doing? If there were any issues along the way, how did the contractor respond to them, and how were they resolved? Do they offer any guarantees or warranties on their completed work? And, of course, is there a referral discount? Some kitchen and bath remodeling companies in the Tempe, Arizona area offer that for past clients and new clients, to encourage people to spread the word and seek them out. We all do it – when you’re looking for a service, you search for it on the web. If they look at all legitimate, we will usually consider the first couple of companies in the search results. This isn’t always a good idea, as search results don’t really have anything to do with the quality of the company. So look at those companies, but confirm their reputations. See if they are rated on other sites, and what past clients have written about them. Companies can pay to be sponsored at the top of the list in searches, so use your online sleuthing skills to make sure they’re a quality provider. Something else I always do? Run any company you’re going to use through a Better Business Bureau (BBB) search, to see if there are any outstanding complaints against them. When you find a kitchen and bath remodeling contractor in Tempe, Arizona, be sure to schedule an initial meeting with them. They’ll discuss the project you want to do, and the cost options for you and time line. You can use this opportunity to ask them about their company. How long have they been in business? How experienced are the specific individuals who will be handling the labor? Do they have any client referrals you can talk to? Also, are they insured? This one’s important – and often overlooked. These three tips will help you avoid negative experiences with contractors in kitchen and bath remodeling in the Tempe, Arizona area. Also, remember that you should never just go with the first contractor who gives you a quote. Quotes by different contractors can vary by thousands of dollars. While price shouldn’t be your only consideration, it’s always smart to get a second opinion and weigh your options before moving forward.